SCMAGLEV technology offers major benefits to the environment. The SCMAGLEV is expected to significantly decrease vehicle miles traveled in the region – teamed with renewable energy the SCMAGLEV could transport millions of people without any emissions. 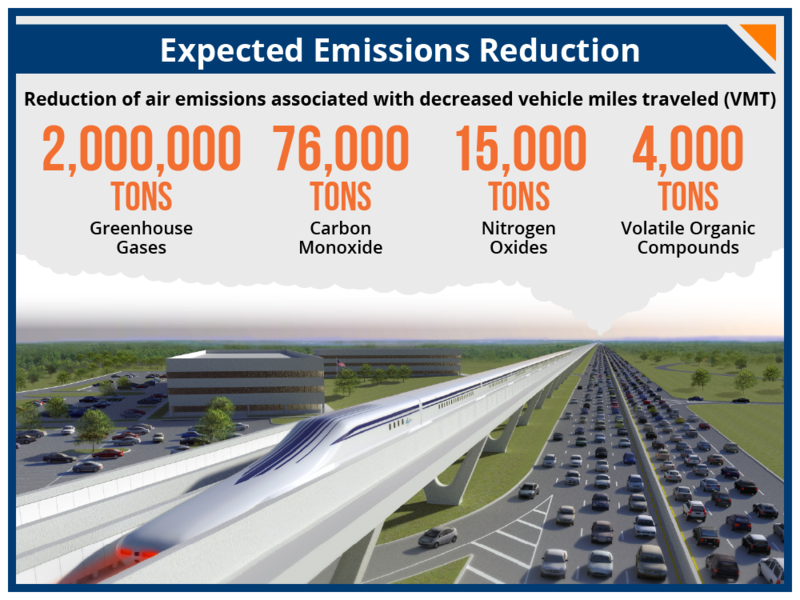 By reducing auto and air trips the SCMAGLEV will also reduce highway congestion, noise pollution, pavement maintenance costs, and provide a host of additional environmental benefits. The SCMAGLEV will help the region efficiently manage growth and relieve stress on the environment. With significantly lower emissions per passenger mile, this train provides an eco-friendly option for those traveling between the region’s top economic powerhouses. Fewer cars on the road mean less emissions and contaminants that harm air and water quality. The population in the Northeast Corridor is projected to increase nearly 15% by 2040. Auto traffic between the cities in the region is expected to increase by 22% by 2040. The SCMAGLEV will provide an attractive alternative to hundreds of thousands of auto passengers every year. This technology is entirely electric and the use of superconducting magnets allows the SCMAGLEV to consume 30% less energy than other high-speed maglev trains, and 50% less than a commercial airliner. Overcoming air resistance is one of the largest expenditures of energy in any transportation platform. The current stage of SCMAGLEV’s development is the result of countless hours of wind tunnel and materials design – all efforts to keep weight and air resistance at a minimum. According to the US Environmental Protection Agency, this reduction in greenhouse gas emissions is equivalent to taking 1.5 coal fired power plants offline for a year! * This reduction in greenhouse gas emissions estimate also accounts for average air emission factors for electricity generation in Maryland from fossil fuel sources. To minimize the impact on the surrounding communities and environment, the train’s first phase will run mainly in deep underground tunnels and in overhead viaducts along the existing Baltimore-Washington Parkway transportation corridor. These design features will make it easier to avoid negatively impacting streams, wetlands, floodplains and other natural and cultural features, while still allowing for the free movement of wildlife, pedestrians and vehicles. Through decades of applied research and continuous improvement, the SCMAGLEV is one of the lightest and quietest large scale transit systems in the world. Since there are no at-grade crossings, there are no crossing arms or whistles as the train passes over/under public roads. The SCMAGLEV makes no contact with the guideway (no wheels on steel rails), nor does it have a noisy diesel engine or catenary connection to overhead electrical wires. The only noise the train generates is the result of air being displaced as it flies by. Conscientious design of the SCMAGLEV infrastructure will minimize any potential impacts on streams, wetlands, floodplains and other natural and cultural features. Also, there will be silt fences and straw bales installed to minimize runoff into any nearby bodies of water, wetlands, roads or other sensitive areas. And, at completion, the vegetation will be restored along with other erosion control measures, as needed. The tunneling process will result in a considerable amount of soil and clay being brought to the surface. Our hope is to find creative ways to use this material in beneficial ways. One example of such a use can be seen in the partnership between the Crossrail project (expansion of London’s Underground) and the Royal Society for the Protection of Birds (RSPB). Crossrail and RSPB used excavated earth to restore a huge area of underutilized farmland back into a mixture of salt marsh, mudflat, and lagoon wetland to support 20,000 birds. The project helped to restore Wallasea Island to its natural state – which hasn’t been seen in over 400 years! Learn more about the wetland restoration project.